"These huge marine heatwaves, which are being exacerbated by global warming, are equivalent to an atomic bomb in terms of impact on coral reefs–they kill millions of corals across huge areas of ocean in a very short time" says WHOI scientist Anne Cohen, who was principal investigator on the work. "We've seen this play out now globally for the past 30-40 years, and bleaching events have become more frequent and more severe." When water temperatures rise even slightly, symbiotic algae that live inside the cells of the live coral start to create toxic substances and are ejected by the corals. The algae normally provide the corals with food and energy, as well as their bright colors. Without them, the corals appear to be "bleached" white, then starve and die. In their study, Cohen's team traveled to Jarvis Island, a tiny, unpopulated coral reef island 1,400 miles south of Hawaii, to study the effects of extreme climate on the corals there. Because Jarvis is both remote and part of a marine protected area, it has been home to stunningly rich coral reefs–but with its location in the middle of the Pacific, it also experiences more extreme heat waves caused by periodic El Nino events than coral reefs elsewhere. "The fact that it's placed right at the equator in the central Pacific puts it at epicenter of El Niño dynamics." says NOAA researcher Hannah Barkley, who was a graduate student and later a postdoctoral fellow in Cohen's lab at the time of the study, and is the paper's lead author. "It's subject to incredible variability and extremes in temperature.". Because there is no observational record of bleaching on the reef at Jarvis before 2015, Cohen and Barkley turned to massive old corals that had lived on the reef for more than 100 years. They took core samples from the corals, creating a sort of skeletal biopsy that records the history of the reef. After running the cores through a CT scanner, they found for the first time evidence of multiple bleaching events preserved in the physical structure of the reef. The longest cores revealed bleaching as far back as 1912. "We found that when the reef bleaches, these big old corals lay down "stress bands," or a dense layer of calcium carbonate, the bonelike material that make up the structure of corals. Those bands appear clearly in the CT scan, and correspond with historical heat waves," says Cohen. The memory of past bleaching events on Jarvis is locked into these corals–they can tell us what has been going even though we weren't there to see it for ourselves." Jarvis has experienced above-average temperatures every four to seven years, going back decades or even centuries. The team discovered that with each heat wave, the reef experienced severe bleaching, yet seems to have bounced back fairly quickly each time. Based on their samples, the group thinks that one major reason for the reef's recovery is the currents nearby. The topography of the ocean floor, combined with the force of trade winds on the surface, brings cold, nutrient-rich water up from the deep. That upwelling feeds a dense array of fish and other aquatic life around the reef, which in turn eat away grassy algae that compete with the corals. In the process, they leave room for new, young coral polyps to eventually settle. "These reefs are resilient, having bleached and recovered many times, " says Dan Thornhill, program director in the National Science Foundation's Division of Ocean Sciences, which funded the research. "But the 2015-2016 bleaching event was particularly severe, so the island is providing us with new insights into how some of the world's most resilient corals are faring in the face of severe bleaching stress." Understanding how coral reefs like Jarvis are able to recover after extensive bleaching will be essential for understanding how other reef ecosystems may grow back in the future, says Barkley. But the 2015 Super El Nino caused Jarvis to heat up more than it ever did before, and the bleaching that ensued was the worst on record. 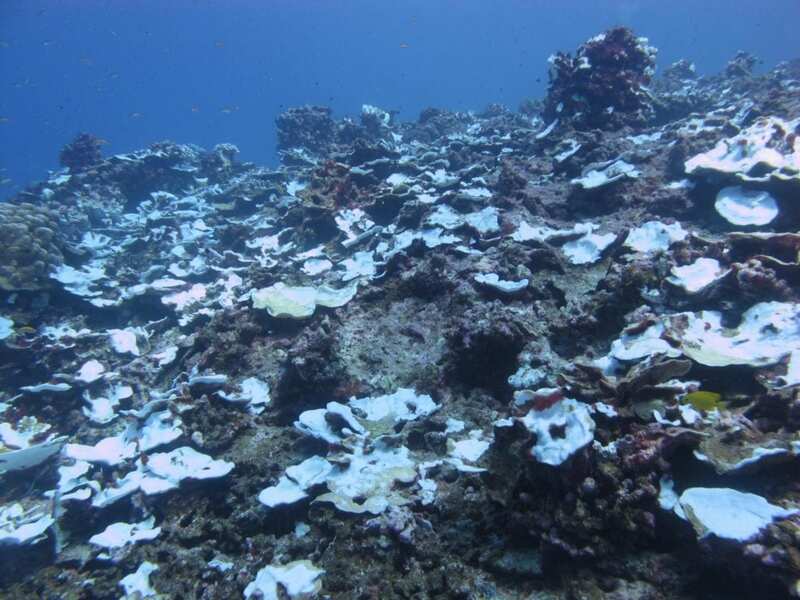 95 percent of island's corals died. "The big question for us is whether the reef can bounce back at all this time," says Barkley. "Even reefs like Jarvis that have regrown in the past have a threshold beyond which they may not recover. What happens over next few years will really help us understand severe bleaching." Still, she's guardedly optimistic. "It's easy to look at a place like Jarvis after the 2015 bleaching event and feel depressed. But the historical record we got from our core samples says we're not beyond hope. Jarvis is just one example: even though we are seeing signs of accelerated bleaching and mortality worldwide, we have a narrow window to address the effects of climate change on corals. Some reefs may be able to persist through huge stress events." "The initial signs of recovery are there," says Cohen. "Now we wait, watch and learn." Also collaborating on the study was Kathryn R. Pietro and Pat Lohmann of WHOI, Cohen Lab graduate students Nathaniel R. Mollica, Hanny E. Rivera, Thomas M. DeCarlo, Elizabeth J. Drenkard, and Alice E. Alpert of the MIT-WHOI Joint Program in Oceanography; Russell E. Brainard and Thomas A. Oliver of the NOAA Pacific Islands Fisheries Science Center; Charles W. Young, Bernardo Vargas-Angel, and Kevin C. Lino of NOAA and the University of Hawaii at Manoa; and Victoria H. Luu of Princeton University. Funding for the study was provided by National Science Foundation awards OCE 1537338, OCE 1605365, and OCE 1031971 to A.L. Cohen, and the Robertson Foundation to A.L. Cohen; National Science Foundation Graduate Research Fellowships to T.M DeCarlo and A.E. Alpert; and a National Defense Science and Engineering Graduate Fellowship to H.E. Rivera.